A bit of a cheater post, this. 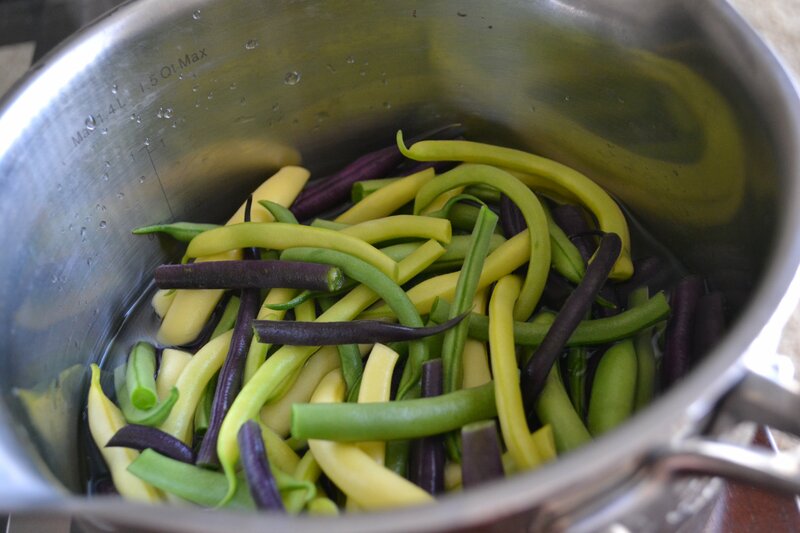 The beautiful green (and purple and yellow) beans came from a neighbor’s garden – have I told you about Bountiful, Utah yet? Everything grows like mad here. Could be why it’s called Bountiful. Maybe? Anyway, the beans came from a garden just up the road and the no-oil salad dressing recipe came from the Divine Ms. B at The Veg Bar (who I wish was just up the road; I’d love to hang out with her). This is true: I read Bar’s post, looked through the recipe and immediately shut down the computer and went into the kitchen to make it. Within a couple of minutes I had a lovely little jar full of tangy, herby dressing*. I had no plans for how I was going to use it until this gigantic bag of colorful beans arrived. Lightly steamed beans and zucchini – and cherry tomatoes (also from the aforementioned garden) that I tossed in at the last minute – topped with Bar’s easy, no-oil dressing. A quick and summery side dish or main course if the heat has you craving only salads. *Minor tweaks: subbed unsweetened coconut yogurt for silken tofu because I didn’t have any; used Thai basil since that’s what I had on hand; omitted the agave nectar because I felt the coconut yogurt was still sweet enough to compensate and threw in a splash of Bragg Liquid Aminos. Toasted walnuts would go very nicely scattered over the top of this bean salad. I love purple beans! Must try that dressing. I have never seen purple beans before! They sure are pretty and the dressing sounds delicious. The funny thing is, when cooked, the purple beans looks just like the green beans. Love the changes you made! I wish I lived up the street, too! If I’m ever road-tripping, I’m popping in on you. You’re the best – I’m already getting way more hits than normal today ;). Haha. I would love that, Bar! Next time I’m in SD we are hitting the town! Yuum yum yum. I just purchased some mixed green beans for my weekend!! NOT at all the same as fresh from a garden, but I haven’t had them in a while so I am excited! If only I had some of your dressing! Fresh garden beans in homemade dressing is one of my summer favorites. 🙂 Hooray! So easy! Fresh beans are light years in taste from what you get in the market. Who knew?! They cook up green, though :-). hee hee….welcome to the “other people’s” food club…of which I am a longtime member. Very few original recipe ideas in this head here! Those beans look so delicious I can hardly stand it. I know, right? You gotta give credit now and again ;-)! Thank goodness for other people’s creativity! That dressing sounds amazing, and I am a big fan of garden fresh beans (well anything green from the garden) – yummy Annie! Great dinner inspiration 🙂 So simple! A good dressing makes any veggies a meal! Loving another oil free dressing recipe! You can never have too many! Ooh, I like the sound of this dressing! thanks for sharing! As for where the name Bountiful came from, you’re half right. It’s also the name of a city in the Book of Mormon and most of the original settlers were members of the Latter-Day Saints. Ah, thank you for the additional information. I was wondering why the city wasn’t named after the founder. I Googled it just to make sure, but I remember originally reading it in Jon Krakauer’s book Under the Banner of Heaven, which gives a lot of Mormon history. Beautiful photos Annie, and those beans look amazing, so fresh! Lovely pictures, Annie & thanks for introducing this new blog to me! A beautiful oil-free dressing which I love! Oh wow, garlic + ginger + basil + lemon – that’s gotta make ANY veggies taste divine! I’ve never tried an oil-free dressing before so thank you for passing on the recipe. I can’t wait to get it onto my salad! I love this time of year when green beans are a ready part of local food!